name='keywords'/> Boomer, Sooner and Johnny-Come-Lately: The History of Norman Oklahoma: A Naval Base on the Prairie: Norman and World War Two. 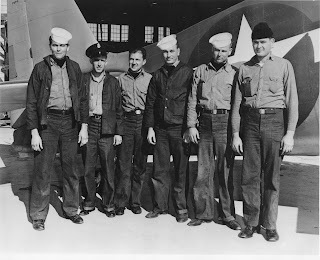 A Naval Base on the Prairie: Norman and World War Two. The Japanese attack on Pearl Harbor on December 7th 1941 placed the United States on course toward another World War. The First World War taught a generation of Americans how to be industrious, frugal, and prepared; the next generation picked up the preparedness torch. In a matter of months after Pearl Harbor, idle factories started producing war related materials, which helped high unemployment, and moved the American economy out of the dole drums of the economic depression of the 1930s. American involvement in the Second World War also created training and careers for over 9 million men and women who joined the armed forces by 1944. Norman, was one of several Oklahoma communities that played an important role in training young men and women to help win the war in Europe and the Pacific. The establishment of naval bases in Norman, a city far from any ocean, resulted from a fortuitous encounter between Savoie Lottinville, director of the University of Oklahoma Press, and K.B. Salisbury, Captain in the U.S. Navy. 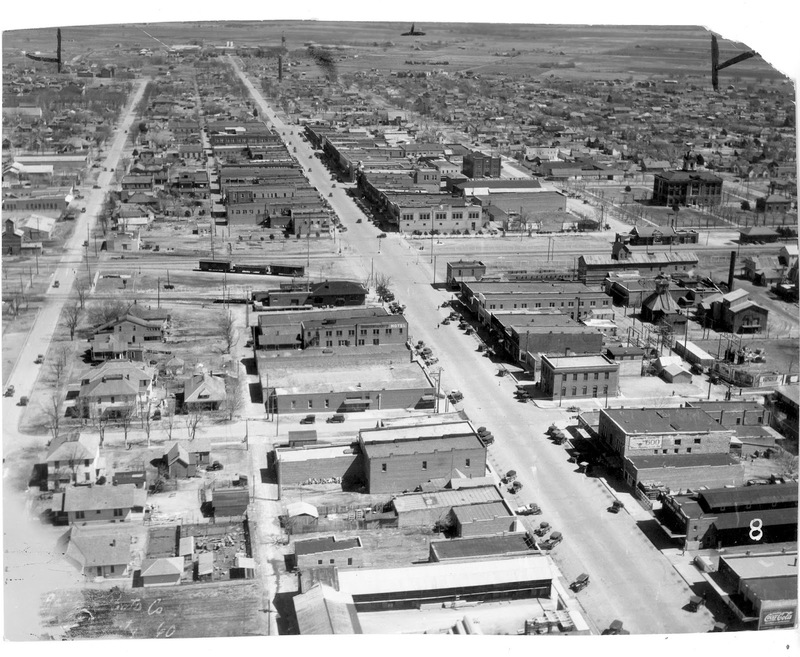 In 1941, Lottinville, eastbound on the Santa Fe, met Salisbury, who was returning to the Bureau of Aeronautics at the Department of Navy in Washington D.C. As Lottinville and Salisbury were getting acquainted, the Navy captain asked Lottinville if there was an interest at the University of Oklahoma in flying. Lottinville proudly told the captain about the University’s new airfield north of town that was named after WWI pilot, Max Westheimer. Salisbury then asked, “Would you be willing to lend it [the air field] to the Navy for the duration of the war?” Lottinville discussed the possibilities with university president, Joseph Brandt, who gave Lottinville the green light to pursue the matter. Brandt and University Regents were excited about the prospects of a naval training station in Norman. In all, the Navy purchased 62,000 acres in Oklahoma. 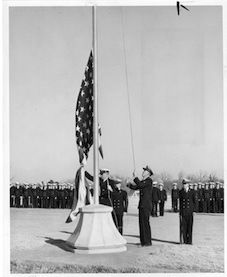 In March 1942, the Navy acquired 2,537 acres in Norman to build a Naval Air Station (NAS), a Naval Air Technical Training Station (NATTC), and a Naval Hospital. 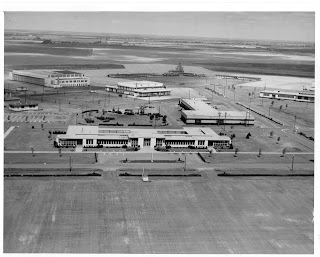 NAS was located north of the town at the university owned (North Base) at Max Westheimer Airfield, and trained young men as Navy pilots. NATTC, military barracks, and hospital were constructed southeast of the University (South Base). The naval training facilities north of town trained young men as navy pilots. 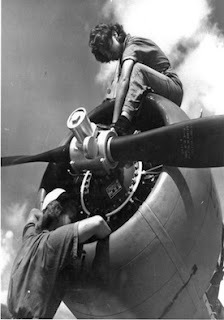 The base south of town educated young men and women in skills that helped maintain naval aircraft and ground equipment. The acquisition of properties, and the increased number of military personnel in Norman, was a well-needed economic boost to central Oklahoma. 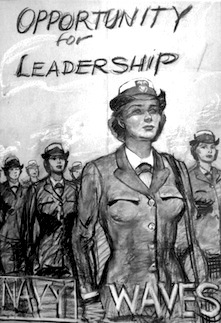 Women played an important role in helping the Navy during WWII. In 1942-43, 27,000 women joined the Navy. 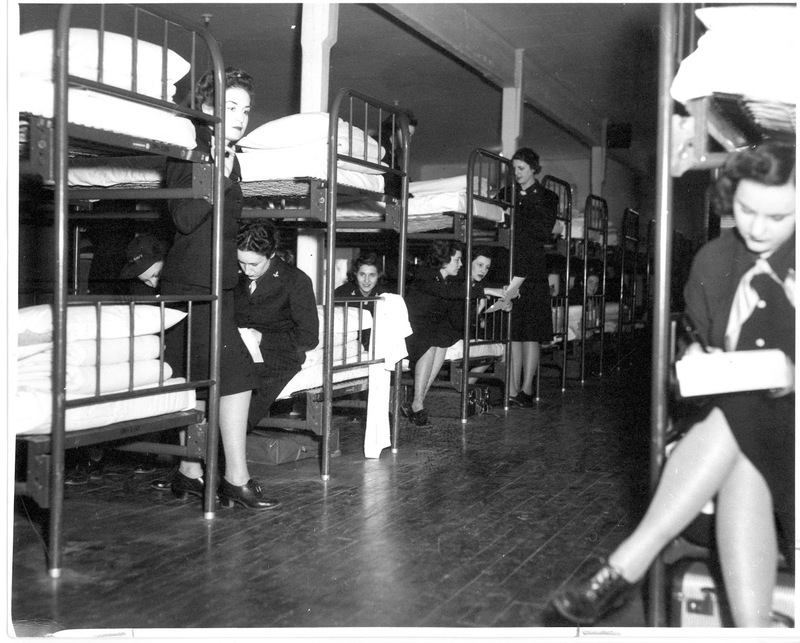 Every three weeks at Norman depot in 1942, WAVES (Women Accepted for Volunteer Emergency Service) arrived at NATTC for training. Women were excited about the opportunity to join the WAVES. They understood that learning to be a machinist mate or an aviation mechanic freed sailors from that duty so they could join the fight outside the continental United States. Young women also believed that joining the military was as an adventure they probably would not have had otherwise. The cultural expectation for women in the early 1940s dictated women’s role as wife and mother. The war altered that expectation and gave young women many other opportunities. After the war, a former WAVE from Michigan wrote of her time in the Navy and remarked how fortunate she was that her father signed the consent form allowing her to join the Navy. She was eighteen years old, fresh out of high school, and anxious to do her part for the war effort. She wrote of enduring the going away party, and all the well-meaning gifts she received. On the day she was to leave for the train in Detroit, she ignored her mother’s tears, and her friends doubts as she excitedly stepped aboard the passenger car with other young women headed to boot camp in Iowa. From “boot” the new recruits were sent to different locations for training, many came to Norman. The first detachment of WAVES arrived from Cedar Falls, Iowa January 29, 1943 for training. 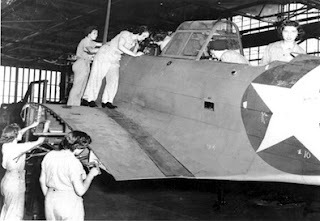 The men stationed at the bases in Norman did not exactly see this influx of women as “true” Navy, perhaps expecting that women would not be required to preform the same duties as men. But, women did adhere to the same Navy regulations as men. WAVES had to stand watches and engage in the other duties of all enlisted personnel. They also had the same punishments for not keeping regulations. A woman recruit mentioned she had to “swab the deck” or clean latrines for minor infractions of the regulations. And like the men, WAVES had liberty, which could also be taken away as punishment. As for the men and women getting “involved” there were strict Navy regulations on how close men and women could associate. For example, WAVES could not let sailors put their arms around them when in a movie. In fact, WAVES were advised to sit in a reserved section. Both Navy Bases in Norman provided an all-inclusive town-like environment, which included a recreation hall, swimming pools, dance hall, motion picture theater and such amenities as a commissary, and hair salon. Variety Shows were on the top of the list for keeping the troops entertained. The variety of entertainment ran from the amateur to the professional. One show featured a University of Oklahoma sorority choir, another featured the national organization of The Society for the Preservation and Encouragement of the Barbershop Quartet Singers of American. The local group of this esteem organization was the Boresome Foursome composed of Oklahoma City Businessmen. There were also “class” acts in the variety shows. Entertainers, who joined the armed forces after Pearl Harbor, used their talents to keep up the moral of the enlisted men. Tex Beneke, a featured tenor sax player with the Glenn Miller Band, often entertained at the Norman base. The base also had their own band called the Gremlins. 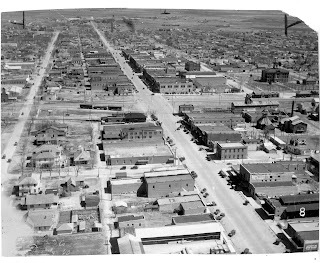 In the early 1940s, Norman had around 11,000 citizens with a small town footprint. The urban area of the town was bordered on the north by Robinson, on the West by Nevada, which later became Berry Road, on the south by Lindsay and on the east by Highway 77 or Porter. The Naval Air Station at Max Westheimer airfield was north of Robinson, at the intersection of Robinson and Nevada; the base was surrounded by farmland. NATTC was SE of the University of Oklahoma extending from Jenkins to Porter. This area was also surrounded with fields. South Base was within walking distance to central Norman, but North Base was quite a hike. Navy personnel had to rely on public transportation, especially the interurban and some local buses. 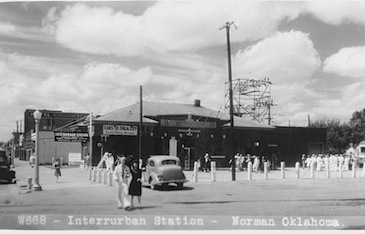 There was a regular complaint by the Navy that there were too few interurban cars and too few buses to transport the service men and women to OKC or Norman. In February 1943, the two-story Norman Armory, east of the Santa Fe tracks near the Courthouse, was remodeled as a United Service Organization (USO) facility. 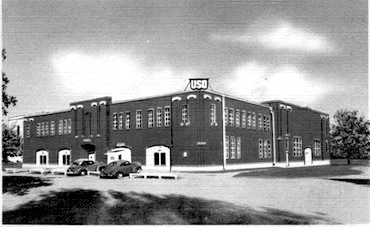 What might be lacking in recreational facilities North and South Base were certainly incorporated into the USO club. The lower floor, or deck as it was called, had a combination gym and dance floor, where each week orchestra dances were planned. Service men and women, and their guests, played badminton, volleyball, and basketball in the gym. The first deck also had a snack bar and soda fountain. In the game room there was a pool tables, a ping-pong table, and a photo shop with a darkroom. On the upper deck there was a room for lectures, a room for studying, and a room for crafts and hobbies. There was also a shower room, a ladies powder room, and a recording studio for service men or women to record a greeting to send home. World War II ended in August of 1945, when Japan surrendered to the allied forces. In all, 74,322 men and women graduated from the Naval Air Technical Training Center on South Base. At the Naval Air Station 6,284 men finished pilot training. Once the war was over, the question was what to do with the Naval facilities. The retreat of the military from Norman was a concern to many, the economy and lively hood of many depended on the naval facilities. Citizens wanted the military to keep the training facilities in Norman, but that was not in the militaries plan until the start of the Korean War. In 1952, NATTC was reactivated to train aviation personnel, and NAS continued to train pilots. By the end of 1955, 46,000 men received training at both NAS and NATTC. In 1959, the bases were no longer needed; the peacetime military declared the land and facilities of both bases in excess to the needs of the Navy. Before the sailors left the base they stationed two mops as a final good-by. 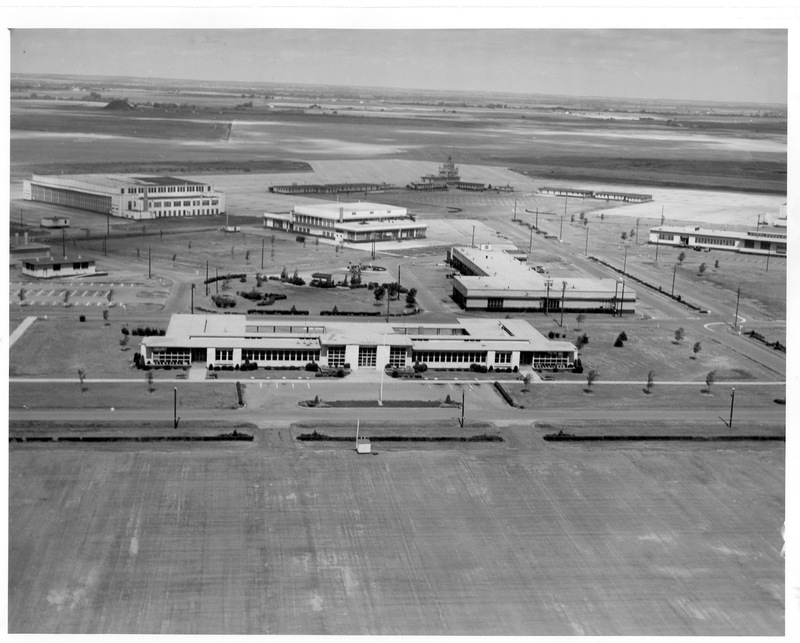 The NAS reverted back to a civilian airfield, where the University of Oklahoma continued the air program initiated before the war at Max Westheimer. Navy buildings were used for other purposes; many became hangers for civilian airplanes. Today Max Westheimer is one of the largest small town airports in the nation. The facilities on South Base were first used by the University of Oklahoma to house different classroom and housing for the surge in enrollments of ex-service men, who were returning to school on the GI Bill. Today, industrial parks and growing businesses occupy the land where so many men and women learned the necessary skills to help the United States and her allies win the Second World War. Navy bases is the most powerful base for a country. Nave bases has aircraft, submarine and more things. These are very helpful for saving a country. Served as a hospital corpsman in 1945 at Norman Ok. Now 92 living in Denver Co. contact. jakenmae@gmail.com. I remember going with my mother on house calls to the South Base student housing. Converted from barracks? I was very well behaved and could be left alone in the car in temperate weather. House calls?! Dr. Abbott.